Tampa Bay Watch, Inc., is a 501 (c)(3) non-profit stewardship program dedicated exclusively to the protection and restoration of the marine and wetland environments of the Tampa Bay estuary through scientific and educational programs. Incorporated in 1993, Tampa Bay Watch performs habitat restoration and protection activities throughout the year, relying heavily on the efforts of community volunteers to help the bay recover from its historic environmental problems. Our programs seek to build citizen awareness, concern and participation through scientific and educational outreach. Individuals of all ages from community groups, schools and universities, fishing clubs, scout troops, and others participate in salt marsh plantings, oyster reef creation, coastal cleanups, storm drain markings and wildlife protection projects each year, demonstrating environmental stewardship in its purest form. In addition to the volunteer habitat restoration projects, Tampa Bay Watch facilitates environmental education programs through “Estuary EDventures.” Students in kindergarten through 12 grades throughout our region visit the $4 million Tampa Bay Watch Marine and Education Center in Tierra Verde for hands-on educational experiences. The mission of this program is to educate students about the Tampa Bay ecosystem while encouraging our youth to act as stewards of our important natural resources in Tampa Bay. This program combines classroom curriculum with hands-on environmental field sessions and service learning projects that facilitate habitat restoration in the estuary. Tampa Bay is one of the only estuaries in the nation to have shown significant advancements in water quality due to the efforts of community habitat restoration projects and public infrastructure improvements. A great strength of Tampa Bay Watch is the support the organization receives from the community. 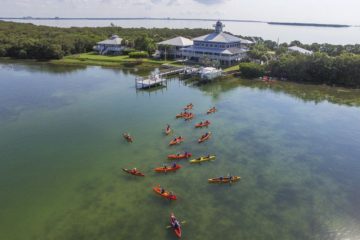 Personal experience with nature builds the desire to protect our natural environments, which is why we offer the bay area community the opportunity to experience amazing Tampa Bay.